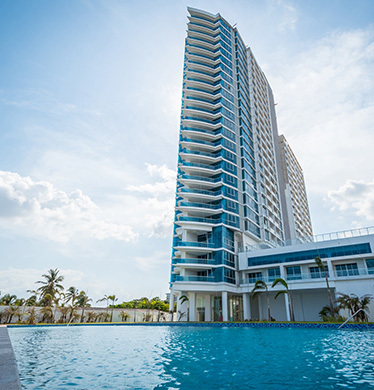 The stunning twin-towers of the Royal Palm residential complex located directly on the Pacific Ocean in Nueva Gorgona is nearing completion with the first units anticipated to be delivered to owners in late July. Occupancy permits are being processed and legal paperwork executed. 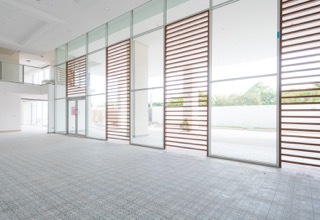 Social areas are receiving final landscaping and the on-site convenience store and entrance hall have new tile work, reflecting the history of Panama. “The tile work is really a great touch,” said Liz Larroquette, who leads the sales effort on the project. “This tile work is reminiscent of what you find in Casco Viejo, which is the ‘old city’ of Panama. It seems like a small thing, but it really blends the old and new, giving the area a rich, authentic feel,” she said. 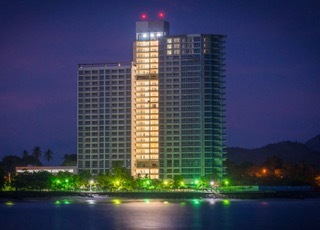 The twin towers of the Royal Palm residences is especially striking at night. Here lights reflect off the calm waters of the Pacific Ocean. Royal Palm, and all other Panamanian construction projects, including the new terminal at Tocumen International Airport and the second line of the Metro, was forced to shut down when negotiations on a new four-year contract between SUNTRAC, the union for the construction workers’ of Panama and CAPAC the employers’ guild, did not reach an agreement and a strike was called. “There was absolutely nothing we could do and we were shut down for a month,” said Roxi Guerra, head engineer for the Royal Palm project, about the strike. “We resumed work as soon as possible after the contract was signed, and now, we are doing absolutely everything to make these final weeks go as quickly and smoothly as possible,” she explained. The twin towers of Royal Palm share an entrance hall which has a nod to “Old Panama” with beautiful Casco Viejo style tiles on the floor. The view of the swimming pool overlooking the Pacific Ocean is nearing completion and the on-site restaurant operator is in final negotiations. Larroquette also explained that Royal Palm’s introductory pricing would end soon. “These prices would normally be gone by now, but with the strike, we were given more time to offer pre-occupancy pricing,” she said. Hi Liz. We would like pricing information when you have time. Hi Liz! Long time no see! Kathi from Texas here. I’m bringing a friend to Coronado for possible relocation in August and think she may be interested in this community. Please send me some info and pricing for a 2/2 unit please. Cant wait to see the finished beauty!! Hi Kathi! Sure thing, I’ll send you an email with some more details – let me know the dates you and your friend will be here and it would be my pleasure to set up a tour for you! Hi MT! Sure thing, I’ll send you some pricing info via email. Can you send me some information with prices, Liz? I called and left a message also. Thanks Louis! It’s certainly looking that way! How much are the unit going to cost? Hi Debbie! Thanks for your message – I’ll email you some information about Royal Palm!